Horse riders have rejected claims that allowing the activity in more national parks in south east New South Wales will devastate the land. The Greens have slammed the State Government's draft strategy for horse riding in national parks and reserves. The party says the plan will open up parts of the Wadbilliga and Kosciuszko National Parks to riding, which could spread weeds and damage the landscape. Endurance rider Fiona Mellor is part of a state advisory council exploring the issue, and says the impacts of horses are minimal. "We've seen a gradual turnaround in attitude, and a realisation that the so called impacts from horse riders are negligible," she said. Two top Saudi showjumpers face being barred from the London Olympics after being accused of using a banned drug on their horses. Sydney Olympic bronze medallist Khaled Addulaziz Al Eid’s horse Vanhoeve tested positive for phenylbutazone (bute) and oxyphenbutazone at the CSI*** in Riyadh (30 November-3 December 2011). And Abdullah Al Sharbatly’s ride, Lobster 43, tested positive for the same substances at the CSI*** in Al Ain (9-11 February). Al Sharbatly won silver at the 2010 World Equestrian Games in Kentucky and both riders were likely to be on the Saudi team for London. The substances are non-steroidal anti-inflammatory drugs and deemed controlled medications under international rules. The riders appeared before an FEI tribunal on 18 and 19 April, confirmed FEI general counsel Liza Lazarus. She said tribunal decisions are “generally issued within 30 days of the hearing, but may take longer”. SEVENHAMPTON endurance rider Janice Cockley-Adams has started the season with two wins in the UK's first two race rides. An impressive turn of speed saw her head a thrilling gallop for the finish to take the honours in Dorchester's Jubilee Ride, with a winning margin of just one second. The 77km (48 miles) ride was the first race of the 2012 endurance riding season and a perfect sharpener for the UK's first international fixture. This was the FEI Kings Forest event in Suffolk, where Cockley-Adams was again riding her nine-year-old Arabian mare Serabitibi in the FEI 2 star 120km (75 miles) against a field of 20, including many of the top riders in the country. "This was Serabitibi's first competition at this distance, so our objective was to secure a completion," she said. "She rode really strongly and I was delighted with her." Cockley-Adams' next outing will be at the FEI event in Nottinghamshire on Roxane du Bout du Monde. Roxane and Janice are shortlisted for the GB team at this year's Endurance World Championships, due to be held in England in August. Members of the Endurance World Class Start and Potential squad (WCSPS) and Young Rider squad will be competing in the FEI2* 120km ride at Mont le Soie in Belgium on the 28th April. Six members from the WCSPS squad have been selected for the Senior 120km ride in Mont le Soie after good results in the selection ride at Kings Forest last Month. Representing Great Britain are, Caroline Cowley, Jane Greatorex, Alison House, Sue Rich, Rebecca Kinnarney and Jo Malcolm. Endurance GB, Chair of International, Emma Miller said, "Riders on the WCSPS are there to gain experience, we are looking for them to become qualified for the elite squad and be in contention for a team place in the next few years. Expeditions such as this are designed to give the riders international experience, qualifications for elite level competition and access to the top vets and farriers". The Young Riders travelling to Belgium to compete as individuals in the Young Riders FEI 2* 120km are, Kate Atkinson, Brett Corcoran, James Dickinson and Louise Rich. Carri-Ann Dark will be taking on the FEI 3* 160km class. This ride is being used as a pre-run for the Endurance Young Rider European Championships to be held in Mont le Soie on the 8th September. Young Rider Chef d'Equipe, Helen Boston said, "This will be a fact finding expedition ahead of the Europeans in September. We don't want to jeopardise the horses over what is a tough course at this stage so the emphasis is for the riders to complete the course. This year we have a really strong group of Young Riders and we have a good pool of people to select the final team from. This will be the first time competing abroad for Brett and James and they hope to learn a great deal from the experience. Our main goal for this year is for a team medal in September, anything else is a bonus". British Elite squad member, Tricia Hirst is also competing in the FEI 2* 120km class at Mont le Soie with Valcq Diamond Sparkle. “HE’S a tough little horse,” remarked one official, as 13-year-old Arab stallion West Coast Acheron strolled past the finishing line after a 160-kilometre trek through bushland south-east of Collie. His journey had started shortly after a midnight on Friday, following a vet check, and ended between 4.30 and 5pm on Saturday. The little chestnut had not raised a sweat at the end of his journey around the Collie racecourse and through the bush. He had been cantering towards the finish when his rider, Norbert Radney, slowed him to a walk. Another rider explained that coming in quietly would lower his heart rate and help cool him down before the compulsory vet check. The cool wind would also help, she added. After the vet check, there were hugs all around when the WA Endurance Riders’ Association honorary veterinarian, Dr Anne Barnes of Murdoch University, announced Acheron and Dr Radney had qualified for the Australian squad to contest the Senior World Endurance Championships at Euston Park near Newmarket in England during August. The 2012 Endurance Carnival will be held on 5, 6, & 7 of May, 2012 at Toorbul, Queensland. It will be a low key event in comparison to the Endurance Festival 2011 due to a very limited number of helpers. We will endeavour for the weekend to be rewarding and enjoyable for all. Some competitors want to qualify for the 2013 Queensland Quilty, others want to qualify and vie for selection to the World Championships at Euston Park 2012, but for most it's the opportunity to enjoy a day in the saddle with a special horse at your chosen distance. The raid Spain Championship CEI 3 * to be held on June 9, 2012. To be considered for screening, the binomial testing should be completed at a minimum speed of 15 km / h. May be considered also some evidence to decide on an individual by the coach in 2012 for individual pairs. The ranking its use as a guide to determine differences between horses with results next. Also, take into account the horses and riders on their own merits (results above) to confirm their status as evidence to decide individually between owners, riders and coach. competition that can be found in the section of regulations section RAID Web RFHE.com. 2. The horse must be at least 8 years to compete in a championship. 3. The horse must have completed 3 CEI 2 * or higher (including test point 1). * Any changes in national or FEI criteria will be decided by the coach. It was a super successful weekend at the OVK Endurance Challenge for the team from Perseverance Arabian & Endurance Horses. Seven horses were entered, with five riders and four grooms, and six finished, with two 3rd places, one 2nd place and one 1st place! This year, the ride – hosted by the Lormar stud and sponsored by OVK – was held over two days, with 80km, 120km and stepladder distances on both days. The ride was well attended with around seventy entries, including TV stars Barry Armitage and Joe Dawson, from SABC3′s THE RIDE. Barry and Joe were riding Lormar horses in their bid to qualify to enter the Fauresmith 201km national ride in July. The highlight of Friday the 13th was a racing finish between father & son pair, Pieter & Lourens Marais in the 80km distance! Both were riding in the Heavyweight category, and shared the honours at the end, with Pieter taking 1st place, and Lourens taking Best Condition. For Team PSV, Ashley Gower and PSV Mauser – standing at number 3 on the ERASA horse rankings – placed 3rd Young Rider in the 80km, while Francois Seegers rode PSV Nile out of novice with a good 80km stepladder. To round the day off for Perseverance, work experience rider Joy Webster did a 60km stepladder on PSV Medina. On Saturday, third cousins Laura Seegers and Wesley Hayes dashed around the 80km together in the fastest time of the weekend. Wesley also breeds Arabians, and has the Olford Stud in Queenstown… it must be in the bloodline! Laura was riding PSV Mabruk – currently at number 2 on the ERASA overall horse rankings – and finished in a time of 4h03min. Laura and Wesley crossed the line together with Laura winning Standardweights and Wesley winning Heavyweights. Mabruk trotted off with the Best Condition for that ride AND the Best of the Best award for the weekend’s events! In his second 80km of the weekend, Ashley Gower and PSV Liberty took 3rd place Young Rider, and Donalyn Hennessey on PSV Ibis came 2nd in the Standardweights. The 1st Lightweight place in the 80km was taken by Baba Sintu on Alicedale Hidalgo, while 1st and 2nd places in the Young Rider category went to sisters Jenna and Kirsty Masterson from the Hofmeyr club. It was another thrilling finish to the 120km, where Young Rider Rory Rous was chasing fellow YR Ninine Erasmus, and caught up with her on the last leg to sccop 1st place and Best Condition. The job description, resume template and nomination form are available from the AERA Secretary, Ieva Peters, email: ieva.peters@bigpond.com or from the AERA website. Applications must be to the Equestrian Australia (National Office) by no later than 30th April 2012. On the saturday 28th and sunday 29th of April, Mont Le Soie will organize a series of competitions for senior and young riders, all in FEI classes. This will be a unique opportunity for the national squads to discover the competition. Everyone knows of course how important it is to prepare well in advance all details concerning their participation to a big event. The startlist for the pre-ride is now available here. The girl’s cheeks are flushed beetroot red, her half moon eyes bright with anticipation as her wiry bay pony jigs around in a circle. Shadows of her horse’s ribs are visible beneath the make-shift saddle, a stirrup-less foam pad that is secured by a rawhide girth strap. The number nine is pinned to her back and chest. She is one of 20 child jockeys that will be competing in the Naadam Festival race held in a remote northern region of Mongolia. The child jockeys are stone faced with concentration as they trot their dread-locked, wild-eyed ponies past the group of onlookers. The children start to sing in mid-trot. Their high-pitched voices echo across the lonely steppe. Our interpreter Molor explains, “they’re worshipping their sky father and giving thanks to the horse.” It’s a haunting, high-pitched chorus that ebbs and flows with intensity as they amble past. My husband, our two good friends and I were at the beginning of a 19-day horse-riding adventure, where we trekked deep within the remote Darhat Valley, only accessible by horse, reindeer or foot. We were in search of the Tssatan people while getting a taste of a nomad’s life. To arrive in time to see Naadam festivities we jumped on an overnight train, hitched a ride on a regional flight and spent half a day in a Russian army van to reach the windswept town of Khatgal. It’s the frontier town to Lake Khovsgol National Park, the deepest lake in central Asia. Naadam is a traditional type of festival in Mongolia held in country towns like Khatgal during the midsummer holidays. Translated as ‘the three games of men’, it includes Mongolian wrestling, horse racing and archery. The Al-Khamsa-RTES Malaysia-Thailand Endurance Open Championship will be held May 17-20, 2012, at Terengganu International Endurance Park in Lembah, Bigong, Malaysia. Events will include a 40 km National Ride, an 80 km FEI1* (Jr & Sr), and a 120 km FEI2* (Jr & Sr). The 40 km ride will start at 6 PM on 18th May, and the 80 km and 120 km will start at 6 PM on 19 May. Please feel invited to the First International ECAHO Show in Poland since many years. The ARABIA-Polska Arabian Horse Festival, under the Patronage of HE Ambassador of the Kingdom of Saudi Arabia, will take place at Sluzewiec Racecourse in Warsaw on the 23rd-24th of June. Our international judges are: Sylvie Eberhardt (Germany), Marianne Tangstedt (Denmark), Katrina Murray (UK) and Raymond Mazzei (US). For millennia, they have shared the world with their human masters. They have carried their owners in the thick of battle, across grasslands, hills, plains and the highest mountains. But there has never been a more trying time for India’s six indigenous breeds of horses than now. The Kathiawari horse, the Marwari horse, the Zanskari pony, the Spiti pony, the Bhotia pony and the Manipuri pony are threatened by the loss of genetic purity, say experts. In January this year the media in Gujarat speculated that there were fewer than 50 purebred Kathiawari horses left. Raghuvendra Singh Dunlod, secretary general of the Indigenous Horse Society of India, a Jaipur-based NGO working towards conserving the six breeds, said: “A horse breed is declared threatened when fewer than 50 breeding mares are left, according to the Brussels-based OIE or World Organization for Animal Health. “By that yardstick, I don’t think that these six breeds are on the verge of extinction. But some of them, if not all, will slide towards that end if something is not done soon..."
A campaign to allow barefoot horses in the annual Man versus Horse race in Powys, Wales, has failed to persuade organisers to change the rules for this year’s event. However, the organisers have promised to review the opinions of the equine and veterinary community and carefully consider the question for the 2013 running of the cross-country endurance challenge. For now, horses entered in the 22-mile race on June 9 must wear metal shoes. The course is steep and the terrain varied to make the contest as even as possible. Competitors race across farm tracks, footpaths, forestry roads and open moorland, with several short stretches over tarmac. It is very hilly, with a total ascent of 3000ft. Endurance runners are to take on horses and their riders in a new race on the southern shore of Loch Ness. The South Loch Ness Man vs Horse Challenge will be held over 16 miles (26km) on the 5 May. Thirty spaces are available for runners and the event will be held under Scottish Endurance Riding Club rules. A vet will monitor horses' fitness. Starting at Foyers Pier, the race includes parts of the Trail of the Seven Lochs and South Loch Ness Trail. Illustrated throughout in colour and b&w with paintings, drawings and a wealth of recent and historical photographs. 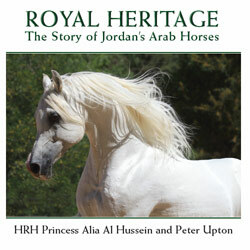 Co-authored by HRH Princess Alia, the eldest daughter of the late King Hussein of Jordan, and the artist and author Peter Upton, Royal Heritage tells the story of the Arab horse in Jordan, from the early days of the Bedouin tribes to the 21st century, a story closely associated with the Hashemite family of Jordan, direct descendants of the Prophet. The account also tells of the Arab Revolt of 1916, in which the Emirs Ali, Abdullah, Faisal and Zeid, with T E Lawrence, drove the Ottomans out of the region, and how some of the Hashemite mares became the foundation stock of the Royal Stud in Jordan. Royal Heritage covers many other adventures including the traumatic events which nearly led to the loss of the Stud's precious mares and describes how, despite these setbacks, the Royal Stud has flourished. In 1987 Princess Alia, Director of the Royal Stud, organised the first Arab horse show to be held in Arabia entitled 'The Arab Horse at Home'. It was an event which inspired other Arab countries to organise horse shows of their own. Princess Alia includes many fascinating personal reminiscences: about the horses she holds so dear, the people involved in the Stud through the years, the famous and infamous, family and friends, heads of state and handlers. The work is richly illustrated with paintings, drawings and rare photographs from old archives and private collections, as well as up-to-date portraits of the Stud and its horses. Peter Upton gives an in-depth account of the horses themselves; the breeding, lineage and preservation of the hugely important Jordanian bloodlines. A story of legend, romance and war, Royal Heritage tells with passion for the first time the remarkable saga of the Arab horse in Jordan. THE FIRST big endurance ride on the horse calendar, which was held at King’s Forest near West Stow, has been hailed a success by one of its organisers. Dianne Luke, who organised the one-day King’s Forest Spring Ride which saw 130 riders take part, said: “It was a brilliant day, and everybody was very happy with it. “There were no accidents, which is always good, and no horses were injured, which is brilliant. The event had an international flavour, with riders from Hong Kong, Dubai and Switzerland, as well as 50 British competitors. Wideham Farm Equestrian Centre, which hosted the event, will also stage the National Championships in the summer. Janice Cockley Adams was the big winner of the day, claiming first place in the class 1 CEI 120km with her horse Serabitibi. Sian Reid and Mauku Mystique won the 160 km New Zealand endurance championship, held over Easter weekend in Hawarden, South Island, New Zealand. The pair won in a time of 9:46.36, one second ahead of Andrea Smith and Glenmore Tariq. Mark Tylee and Jacob were third. Frank Aldridge and Merimindi Finale won the 100-km CEI 1* in 5:45.40. The CTR National Championships were held in conjunction with the endurance. The first FEI 1* competition will be held 13-14 April at Oriental Puebla, Mexico. Km - 30 Into a hold of 30 min. Km - 30 Into a hold of 40 min. For all 160Km rides must have min. 5 Vet gates. The organisers of the annual Man versus Horse race in Powys are being urged to change the rules so its four-legged entrants can compete without shoes. Riders whose horses go "barefoot" claim metal shoes can harm the animals' hooves in the long term. Sarah Braithwaite, who has written a book about barefoot horses and competes in endurance rides, said rules forcing shod horses were outdated. A spokesman for the Llanwrtyd Wells event said shoeing protected horses. Green Events said a committee was meeting on Wednesday night to discuss the issue and would release a statement on Thursday. The spokesman added: "It has always been a rule of Man versus Horse that horses are to be shod because of the course, and because it's a race rather than an endurance ride..."
Travel writing is supposed to be about providing a lyrical introduction to a new place or at the very least, showing a destination in a new light with a quirky angle and new things to do. But how do you do that when said destination is the Cévennes - an area so beautiful, so wild and so historic that the world and its wife have waxed poetic about it? And worse still, when the experience you’re writing about has been done before by the luminous likes of Robert Louis Stevenson? Stevenson’s 1879 Travels with a Donkey in the Cévennes was one of the first travel tomes to grab the popular imagination and paved the way for the likes of Paul Theroux, Ryszard Kapuściński and William Darymple. His adventures along a 120-mile route through some of the most beautiful countryside on Earth with only Modestine, an entertainingly cantankerous donkey, for company, make for a wonderful read. So here I am, attempting to follow in some very illustrious footsteps, with an equine adventure of my own. Not for me though, the crotchety charms of a donkey (although you still can if you want to); instead, I was in the Cévennes in pursuit of an altogether more thoroughbred beast: the Arab. HESSEQUA NEWS - On 23 and 24 March, Wynland Endurance Club hosted a two day event with distances of 80 km and 120 km to choose from. The route took the rider and horse through the dune veld of the Albertinia area, making this a difficult ride due to the deep sand on the dunes. With 871 days to go, the Organizing Committee for the Alltech World Equestrian Games 2014 to be held in Normandy, France, has named Nicolas Wahlen as endurance event organiser. Wahlen, a former professional rider, organized the 2000 Compiegne, France, World Endurance Championships and since 2004 has been event organizer of international endurance competitions in over 15 countries, including the 2005 European Endurance Championship. The discipline team has selected specialist technicians in the organisation of equestrian competitions, each expert in their own discipline. Para-Equestrian sport : Didier FERRER as well as a soon-to-be-appointed specialist. L’esprit d’équipe, puissance 8 : les responsables de disciplines rejoignent la Direction des sports. Le Comité d’organisation Normandie 2014 s’enrichit de profils d’experts équestres pour orchestrer une organisation sportive à la hauteur de l’événement. Nommés au sein de la Direction des sports, les responsables des 8 disciplines officielles sont les acteurs d’une co-construction qui débutera en mai au Haras du Pin par trois journées d’échanges et des rencontres avec leurs homologues de la Fédération Equestre Internationale. Held every 4 years, alternating with the Olympic Games and under the authority of the International Federation for Equestrian Sports (FEI), the World Equestrian Games are the biggest equestrian event in the world. They will be held from 24 August to 7 September 2014. The event brings together 8 official disciplines over a period of two weeks of competition: Jumping, Dressage, Eventing, Driving, Reining, Vaulting, Endurance and Para Dressage. Over 60 nations and nearly 1000 athletes will come together to demonstrate equestrian competitions of the highest standard to the 500,000 visitors expected at the various sites. The scene is set for Britain’s biggest and most demanding endurance ride as the final preparations are completed for the Exmoor Golden Horseshoe Ride, from May 13 to 15. The ride, with four competitive classes, is held over the challenging Exmoor terrain, classed as among the most challenging tests on the endurance calendar and attracts riders from all over the country, and sometimes from Europe. “With London hosting this year’s Olympics, there’s a real buzz in the equestrian world at the moment and this year’s Golden Horseshoe is set to be as popular and exciting as ever,” said ride organiser Barbara Wigley. THE Bahrain Royal Equestrian and Endurance Federation (Beef) has stepped up its preparations to host the Crown Prince Endurance Night Ride, to be held on Friday. To be hosted by the Bahrain International Endurance Village in Sakhir, the prestigious event will be open to all riders and is covering a total distance of 120km. Chairman of the Supreme Council for Youth and Sports and Bahrain Olympic Committee President Shaikh Nasser bin Hamad Al Khalifa highlighted the significance of this event and its popularity among stables. He expressed thanks and appreciation to His Royal Highness Prince Salman bin Hamad Al Khalifa, the Crown Prince, for his support for the activities of the federation and all riders. Shaikh Nasser stressed that this continued backing is an incentive for everyone to give their best and achieve the needed aspirations and goals. He also asserted the importance of the upcoming event, which will be for the Crown Prince Cup, and vowed to provide all forms of support to the federation to ensure this ride is a big success. And following the great success over the past five years in the Crown Prince Cup, Shaikh Nasser noted that the night rides have special taste with different environment that has its influence on the competition. Shaikh Nasser believes the competition for this weekend's race will be fierce as all the riders are presently having serious preparations. The Royal Endurance Team captain also noted that his stable has been training hard over the past few weeks and in accordance to the plan for this race. He lauded the efforts and contributions of the team members in past achievements. Shaikh Nasser stressed that the Crown Prince Ride is one of the largest and most important races in the Kingdom, especially as it comes at the end of the season. Shaikh Nasser noted that specific strategies need to be set up for night rides, and wished everyone success. Jeremy Reynolds and A Kutt Above took the win in a flat-out race to the finish at the Endurance Ranking Trial CEI 160km in Mt. Pleasant, TX. The race served as the USEF Selection Trial for the 2012 FEI World Endurance Championship taking place in August. Jeremy Reynolds racing his grey endurance horse, A Kutt Above. Forty-five of the nation’s top endurance riders took to the trail at Priefert Ranch, March 31, over a “cloverleaf” course designed to replicate the Championship environment. Nineteen crossed the finish line and were named to the United States Equestrian Federation’s “long list” of contenders for the FEI Championship, Aug. 25 in Euston Park, Thetford, England, where only six U.S. riders will compete. Reynolds narrowly beat Wendy MacCoubrey and Reach for the Gold, at 8:16:03 versus her 8:16:05. Becky Hart was a close third riding No Repeat (8:16:09), Heather Reynolds was fourth on Riverwatch. The top finishers were strong all day and recovered well in the vet gates. Reynolds (San Jose, CA) and A Kutt Above also earned the coveted Best Conditioned Award/ Along with the other 18 finishers the pair was named to the USEF “Long List” of championship contenders (the horse with both Reynolds as riders). Although Reach for the Gold was ridden by proxy jock MacCoubrey, the horse made the Long List with owner Valerie Kanavy of Fort Valley, VA. Both Kanavy and Hart (San Juan Bautista, CA) will seek a chance to earn another FEI World Endurance Championship title. Kanavy currently has two titles to her name and Hart will seek a fourth, this time with her own No Repeat. In addition to the 19 finishers, Ross has three discretionary horse/athlete combinations he can add from among those who did not compete or complete in Texas. Two of those slots have been taken: he named John Crandell III and Heraldic even though Crandell elected to withdraw Heraldic after the gate 2 vet check, which the horse passed but Crandell had concerns about deficiencies in his mount’s metabolics. Jeremy Reynolds and his grey arabian A Kutt Above. Jeremy Reynolds and A Kutt Above, are ready to race in Texas. Ross also named to the long list Deborah Reich who was unable to compete in the selection trial due to injury. Her horse, DJB Juniper, finished seventh. Sometime in July the top 19 plus Ross’ wildcards will go on to complete a short course (40-60km) that will serve as an evaluation for soundness, and 12 horse and rider pairs will be named to a “short list” from which the final six competitors will be named (plus alternates) no later than one week prior to the FEI Championship, which takes place a week after the Olympics and about 35 miles away. USEF director of endurance and reining Vonita Bowers said the U.S. has a talented field of athletes and horses from which to choose, and is looking forward to once again standing on the international podium for endurance, from which the country has absented itself since Valerie Kanavy’s individual Gold Medal in 1998. The USEF is verifying the complete long list. It will be posted here as soon as it is made available.